Ellipse boxwood — interior open to view. 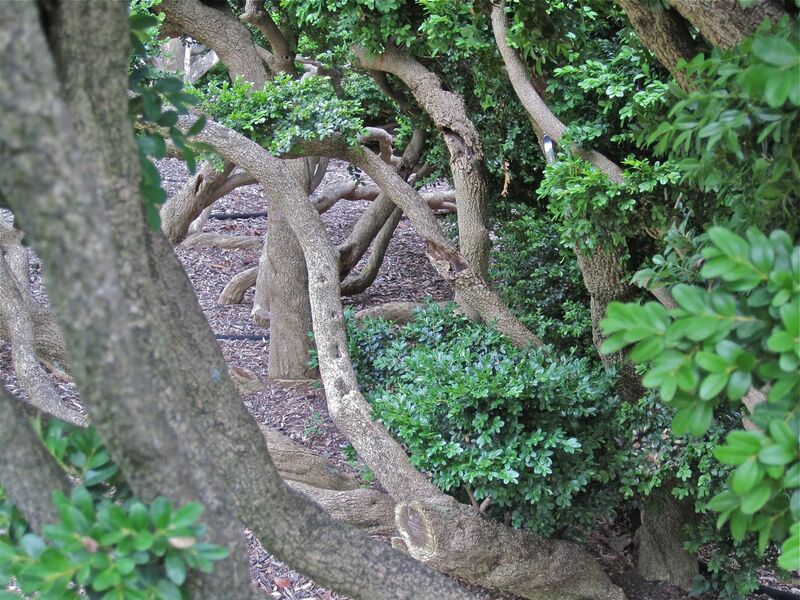 I am fascinated by the old boxwoods of Tudor Place, an historic estate in Georgetown. 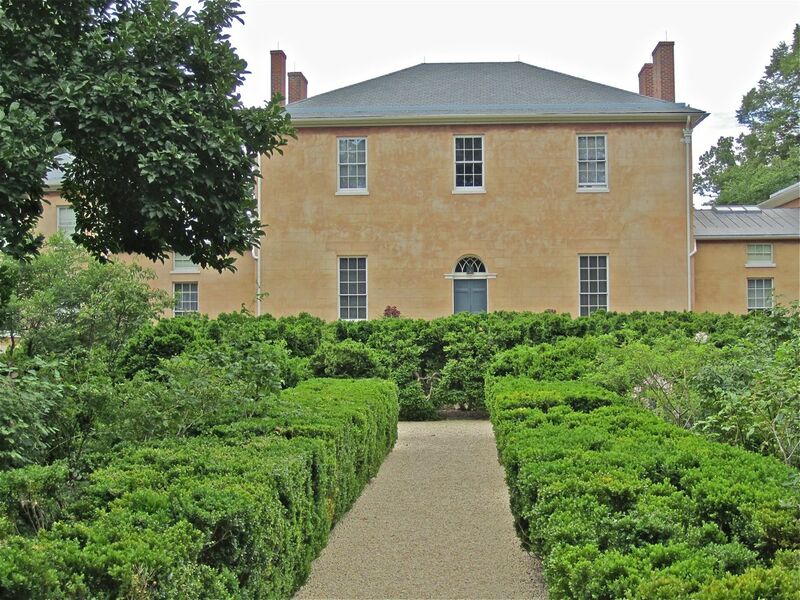 In 1805, soon after she and her husband purchased the property, Martha Custis Peter, the granddaughter of Martha Washington, planted (or more likely, directed to be planted) an ellipse of Buxus sempervirens ‘Suffruticosa’ in the center of the drive on the north side of the house. Walkway to the ellipse and house from the north side with rose garden on the right. The neoclassical house was designed by William Thornton, architect of the U.S. Capitol and completed in 1816. Six generations of the Peter family lived there until 1983. For the Tudor Place Foundation, who received the estate in 1983 from a direct descendant of Martha’s, they must be a much-loved treasure and (I suspect) a big preservation headache. Today, the ellipse is over 5′ tall, as one might expect, given its age. When I toured the property almost ten years ago during a Landscape Design class, the teacher fretted that it was too large for the original design and for the scale of the house and drive. Boxwood ellipse before 2010. Photo via the Tudor Place Foundation website. 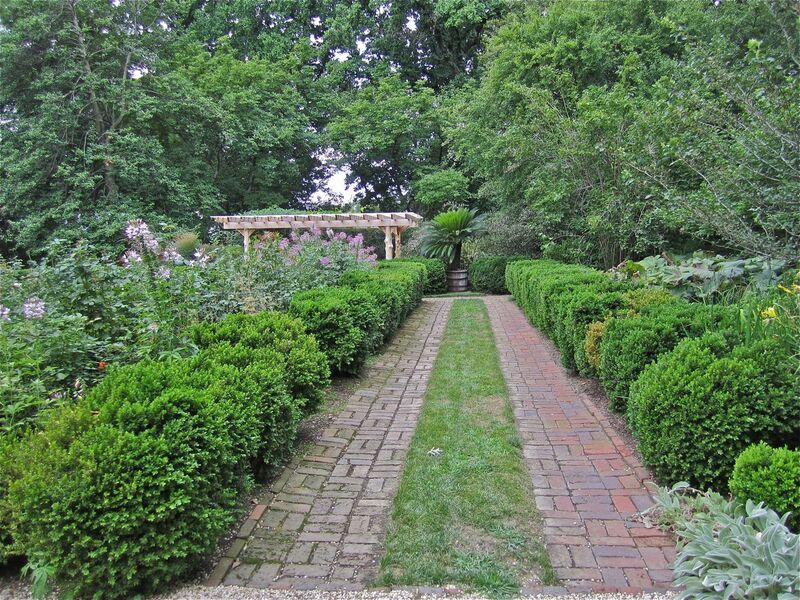 At that time, the boxwoods were nearly as tall as now, but still nicely filled out all around. As such, I found them impressive, but not particularly interesting. However, in February 2010, Washington had the deepest snows in over 100 years. 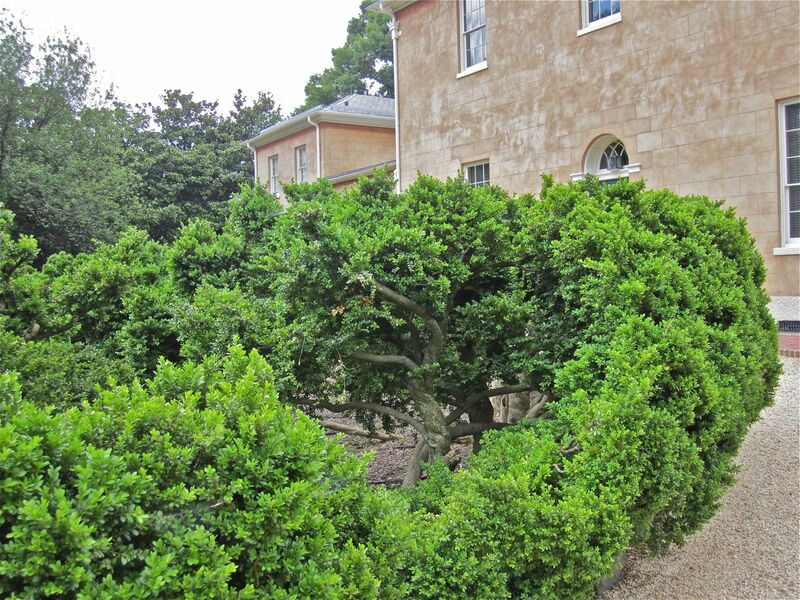 The damage to the boxwood ellipse and to many other old specimens at Tudor Place was severe, and the hedge’s interior was opened to view in many places. Now the ellipse shows interior volume as well as exterior. My sympathies to the Foundation, but I find the old shrubs’ new negative spaces and sculptural qualities beautiful and rather moving, and I took photo after photo. Ellipse from west side. 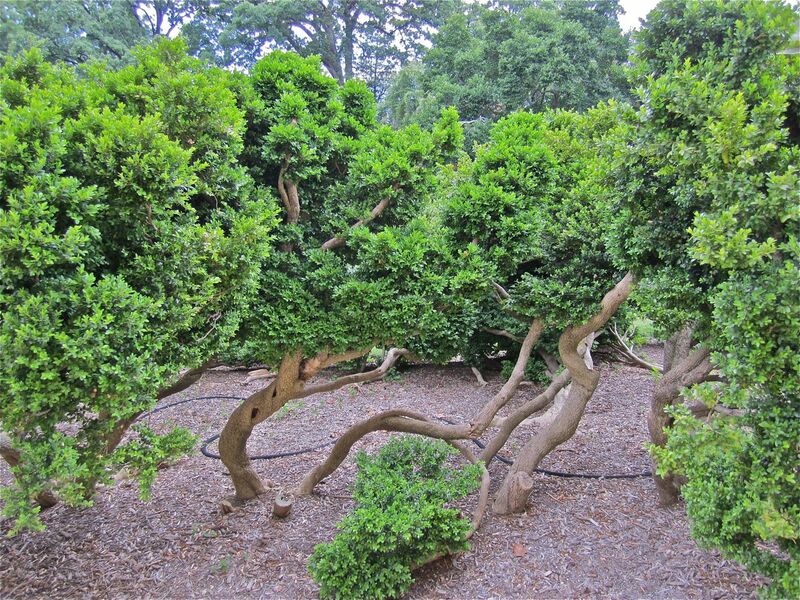 The bushes are English boxwood. Ellipse boxwood. Click on the photos to enlarge. 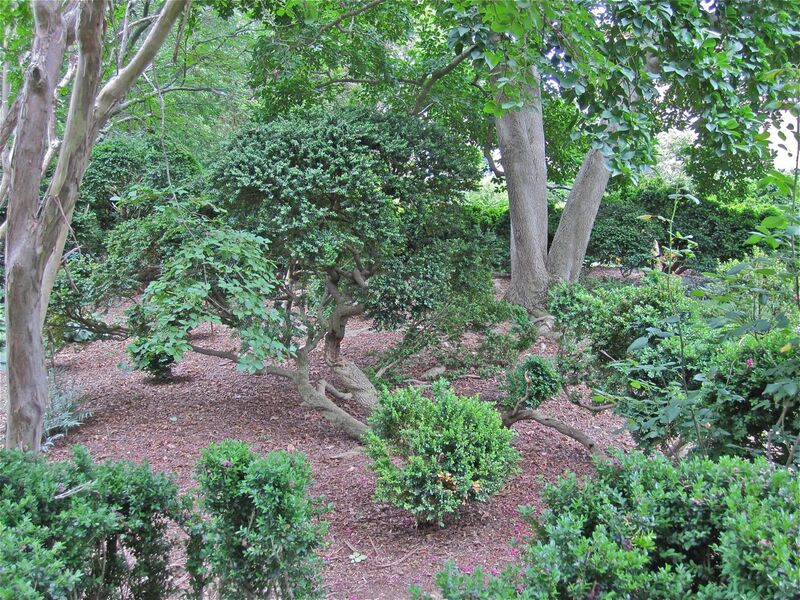 Boxwood in the “tennis lawn” planting bed. And these along a walkway near the bowling green. A walk along the bowling green seen through old boxwood. Click on photo to enlarge. I wonder how long they will be left in place, given their current condition. I find them beautiful, but they don’t really conform to a classic neat Federal or Colonial Revival aesthetic. But who wants to replace bushes planted by the step-granddaughter of the father of our country? If they were mine, I think I would want to turn the old ellipse’s design somewhat inside out and fill many of the open spaces with the contrasting foliage of other perennials planted inside them — as is happening among some of the equally ancient boxwoods at the Bishop’s Garden at the National Cathedral. I’d like to see a few Rudbeckia maxima flowers waving over the center (although whether the ground beneath the ellipse, full of old roots, would support more plants is a practical question). The rest of the Tudor Place garden is lovely as well, with the center north-side area symmetrically squared off in true C.R. style with brick and gravel walkways. The well-maintained property actually shows off an interesting continuum of original and reconstructed functions and design styles from the last two centuries. According to an archaeological study and plan by the University of Maryland, the planting of the south-side lawn, which contains the 200-year old tulip poplar and once had a view of the Potomac River, has changed relatively little since the building of the house (and therefore is of little archaeological interest). And, of course, the ellipse is also truly from the Federal period. The walkways and rose/knot garden existed in their current layouts by the 1830s. 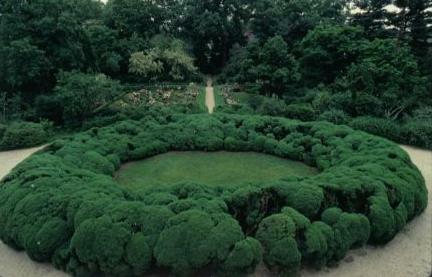 But the knot garden was destroyed in the 1860s by intruders seeking boxwood for Christmas wreaths. It was replanted by the last Peter owner in the 1930s, using old family plans, although he moved it to the opposite side of the center walkway. Walkway from center to west side with rose garden on left. 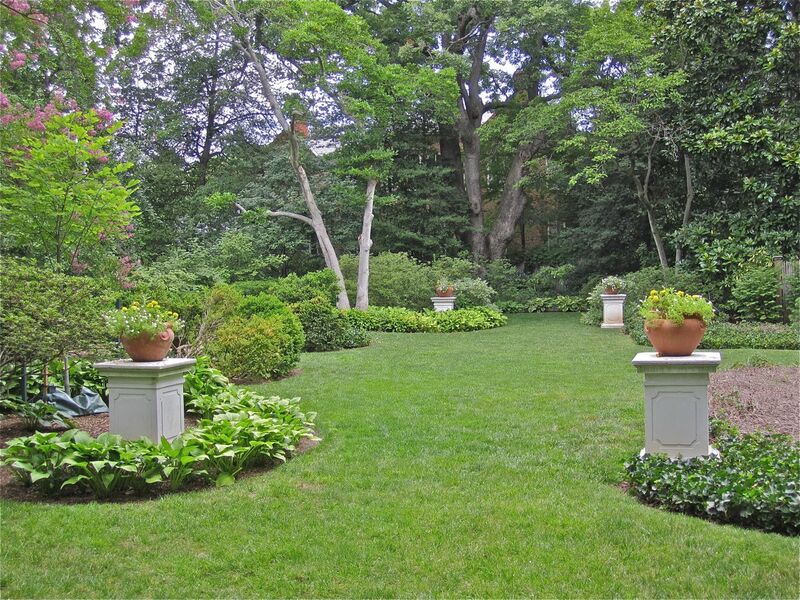 The northeast-side garden with lawn and curving beds was an orchard and a tennis lawn before its current 20th century design. On the west side, there is a 20th century bowling green and a fountain on what had once been a wooded area. 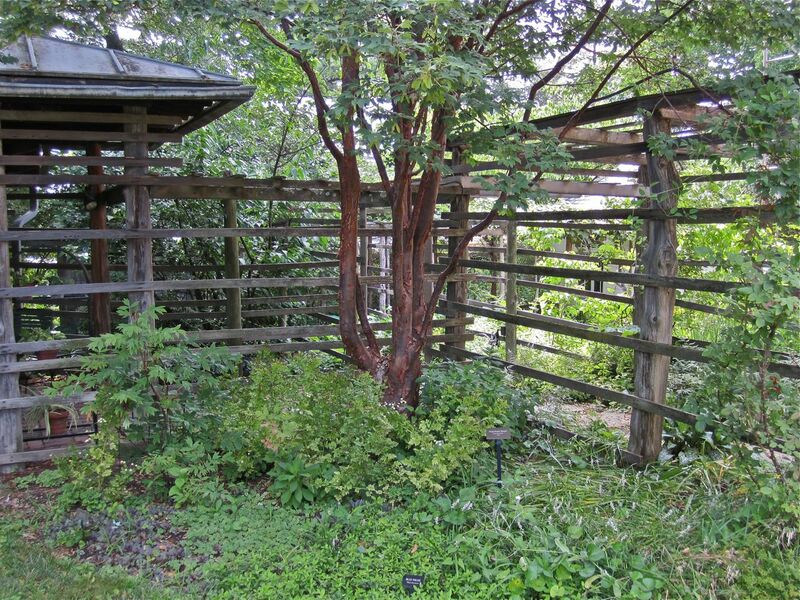 A pretty 20th century patio, “Japanese” teahouse, and arbor sit off the west wing of the house, more or less in the location of the 19th century kitchen garden. They look Tidewater southern more than anything else. “Japanese” tea house and arbor. The garden is open to the public Monday through Saturday, 10 a.m. to 4 p.m., Sunday, noon to 4 p.m. There’s a small charge of $3. See this link for information about touring the house. To see more photos and a garden plan, click “Continue reading” below and click on any thumbnail scroll through large pictures. Tea house patio looking to the south lawn. Obelisk on roof of tea house. Japanese tea house with mid-century garden chairs. The 20th century pool on the bowling green. Bowling green viewed from the south side. Garden hose in half barrel. Old apple tree with climbing rose on the site of the old orchard. Stock and old rose hips. Blackberry lily or Crocosmia (?) in the north-side garden. Rose garden viewed from west side. Current garden plan via Tudor Place Foundation website. The house and ellipse in 1910. The garden in the 1930s, looking north. A walkway along the bowling green seen through old boxwood. Old locust tree stump in the ellipse. 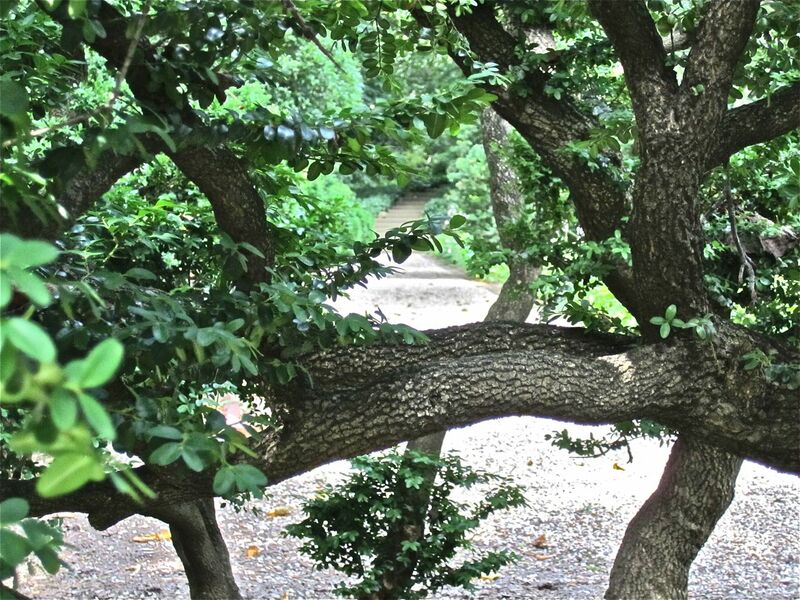 In the 19th century, visitors would tie their horses to this tree. Walk to the ellipse and house from the north side with rose garden on right side. Next Post Sidewalk planter, 18th and F Streets, N.W. 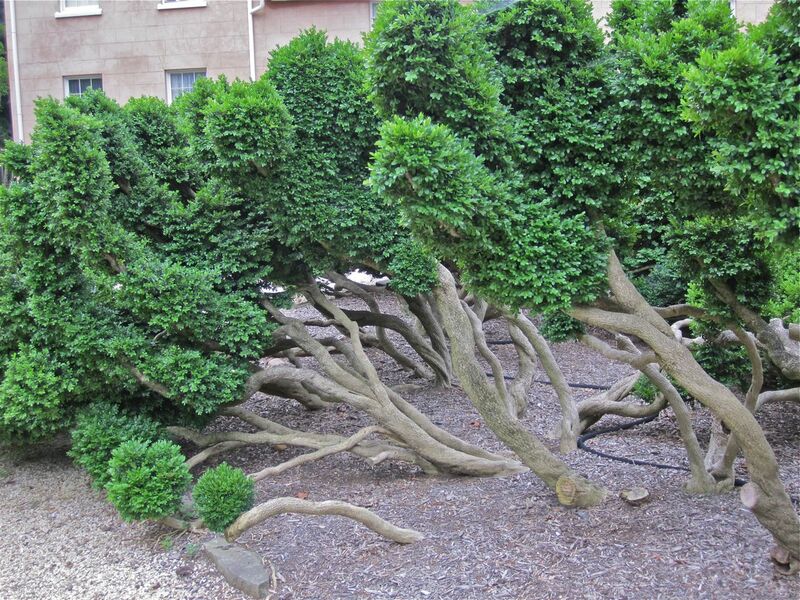 I’ve never seen boxwood like that. We had some overgrown and very ugly boxwood on both sides of our entrance stairs. Ugly is nice, but these are amazing,. Maybe I am the odd one out but I love the old growth look to it, a movie should be playing. I thought they were so compelling. 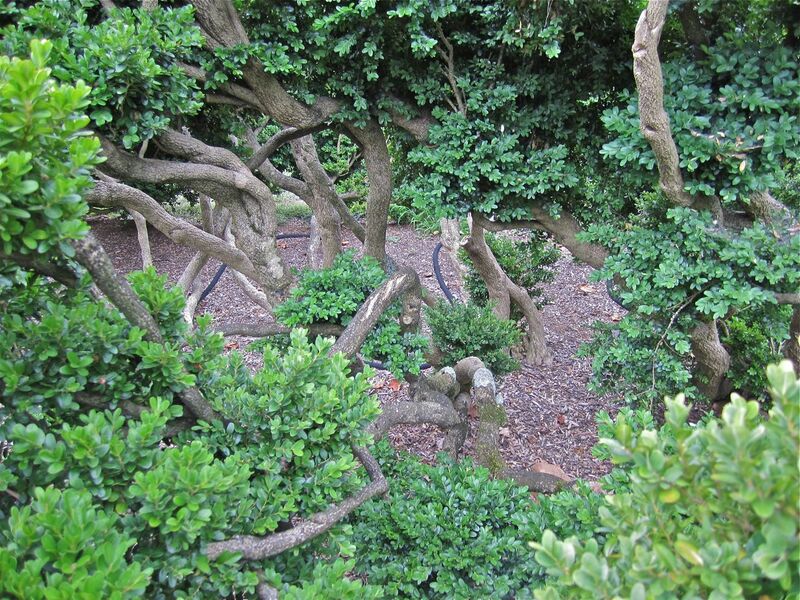 But they raise interesting questions of how the caretakers of an historic garden can or should respond to the inevitable age and damage to beloved woody plants. Do you stick to the original design intent and take them out and re-plant? Or do you let the design develop in another direction — either just leave the ellipse as a sort of display case for the very old, interesting bushes or maybe let it become a mixed planting of old box and perennials as I might do “if I were queen”. If you’re in the D.C. area, check it out. It’s a lovely old place.